A large group of survivors wearing symbolic purple shirts makes the turn during the Survivor’s Lap at the North Shore Ninth Grade Center. The Relay for Life-Houston North Channel was a huge success last Friday, May 6 as more than $136,000 was raised to benefit cancer research. The North Channel community is joining together the fight against cancer. According to North Channel Relay officials, the fundraising totals were still being tallied as of press time and were expected to significantly increase. With more than 50 teams participating, the “May the Cure be with You” Star Wars themed event drew hundreds of walkers that participated in the event at the track of the North Shore High School Ninth Grade Campus. The North Channel group also received an award from the American Cancer Society for raising more than $1 million toward cancer research for the past 13 years. Voters in Galena Park swept out all the incumbent councilpersons, affirming the changes they started two years ago with the election of Esmeralda Moya as Mayor. With a large turnout of 1063 voters, the unofficial results saw Moya returned to office, with 772 votes, against her challenger Dawn Fisher with 275 votes. This vote spread was also seen in the four council positions,as follows: POSITION 1: Chersky 714, Simms 309; POSITION 2: Silva 743, Hinojosa 281; POSITION 3: Broussard 723, Serna 250, Groba 60; POSITION 4: Ponder 734, Flores 304. JACINTO CITY, passed the Proposition raising the Sales Tax by 1 cent, to 8.25 percent. The bond website will be transitioned into a bond construction website in order to provide our citizens information about the status of the bond projects. On Saturday, May 7, Sheldon ISD voters approved the passing of the 2016 Sheldon ISD bond. The measure passed with nearly 70 percent of the vote. “The Sheldon ISD voters made a collective decision to invest in their community and our schools, and for that we are extremely thankful,” said Superintendent King Davis. 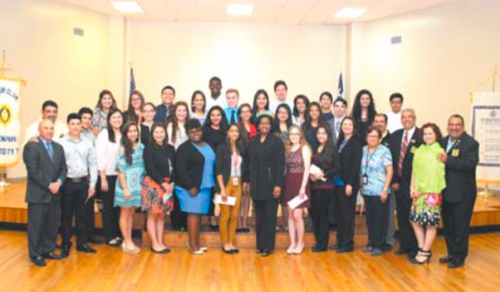 On Wednesday, May 4th, 25 Galena Park High School students received a total of $15,000.00 in scholarships from the Galena Park/Jacinto City Rotary Club. These scholarships will assist the students in pursuit of their college and career goals upon graduation. GALENA PARK FIRE CHIEF PAUL GREGORY, with firemen Gab Perez, Dean Bailey, and Ed Thraen, stand with the new Sutphen Pumper that went into service last month. This is the first new fire engine for the GPFD in 15 years, according to Gregory. It cost over $500,000, paid for by the Texas Forest Service and the City of Galena Park. Features include a 1000 gallon tank, foam, rescue equipment such as thermal imaging and the “jaws of life,” and other saws. The department has 6 full time and 22 part time firemen, and 6 volunteers, and is looking for more.